Luckily there appears to be a chance of snow in Boston this weekend. 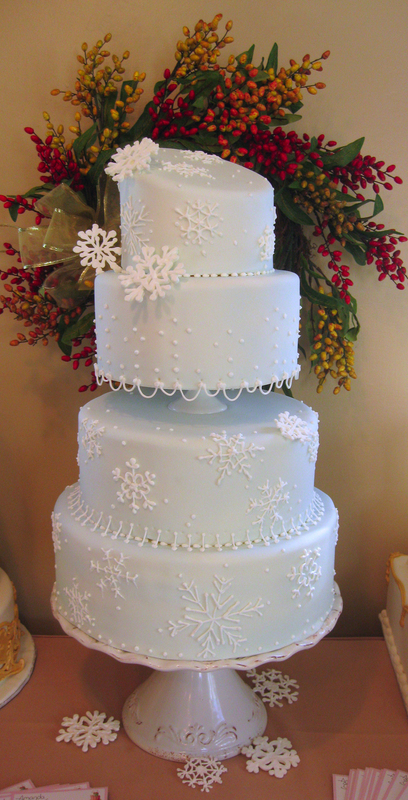 In the spirit of dreaming of a white Christmas I designed this particular snowflake cake. All the snowflakes are edible. This cake was on display at Des Rosiers Design for the Charlestown Holdiay Stroll. Lynn Kimmel of Des Rosiers Design does amazing work. She specializes in window treatments and has fabric samples galore. Definitely contact her if your home is in need of some sprucing up for the holidays and the new year. Sure it looks weddingy but this design could be for any wintery occasion. Gotta love snowflakes!